Russian president Vladimir Putin’s upcoming visit to Uzbekistan reflects the Central Asian republic’s importance to the Kremlin. Putin will be in the Uzbek capital Tashkent on June 4, en route to China, where he will attend a summit of the Shanghai Cooperation Organisation. Analysts see both visits as part of a refocusing of Russian interest on the former Soviet Union, and say it is significant that Uzbekistan is the first Central Asian state he will visit since his election in March. Tashpulat Yoldashev, an Uzbek political analyst based in the United States, says Putin will seek to ensure that President Islam Karimov does not place obstacles in the way of the NATO troop withdrawal from Afghanistan in 2014. NATO’s supply route, called the Northern Distribution Network, goes through Uzbekistan to Afghanistan. "Putin's task is to calm Karimov so that he doesn’t obstruct freight transport," he said. "Uzbekistan has increased the [transit] fees on the Northern Distribution Network and is asking for more and more. His western partners are unable to reach agreement with him." Putin is also likely to address Uzbekistan’s troubled relationship with its neighbour Tajikistan, which also affects Moscow’s regional interests. Uzbekistan has been blocking freight trains carrying Russian and other goods through its territory to Tajikistan. equipment it needs. 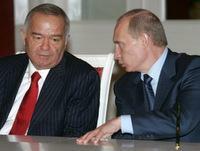 Putin will try to convince Karimov to relent.